In the days leading up to his death, comedian Ted Healy had been under continuous observation by his sister, Marcia, and manager, James Marcus, to keep him from drinking and otherwise out of trouble. Hymie Marx, a bodyguard, had been hired not to protect Healy from his fans but to protect him from himself. Dec. 25, 1937: Betty Braun Healy and Ted Healy in an undated photo published in the Daily News. 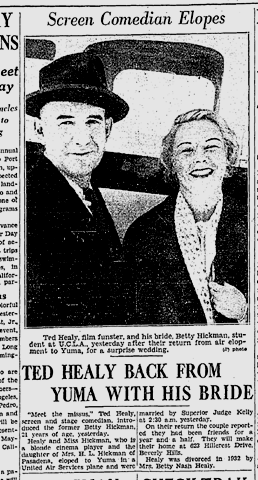 May 16, 1936, Ted Healy elopes with the former Betty Hickman, as reported in The Times. 623 Hillcrest Drive, Beverly Hills via Google Street View. Despite the estrangement, there was apparently a reconciliation, as she became pregnant and gave birth to their son, John Jacob Healy, on Dec. 17, 1937, at University Hospital in Culver City. Dec. 18, 1937, a son is born to Ted Healy and his wife, Betty, as reported by The Times. This entry was posted in 1937, Film, Hollywood and tagged #Wikipedia, 1937, film, Ted Healy, Three Stooges. Bookmark the permalink. The Hollywood memoir is a genre that tends to be unreliable at best and utter fiction and downright lies at worst, so I’m only using original news reports. Ted Healy, a film funster? He seemed as mean-spirited on screen as off. Pingback: Playground to the Stars » What Really Happened the Night Ted Healy Was Beaten up at Cafe Trocadero? “so I’m only using original news reports.” Which would never be inaccurate, would they? The original news reports are far more accurate than anything you’ll find in the books on the subject. My father in-law was the owner and editor of a small town newspaper from the late 30’s to the early 70’s. Journalists from that era were far different than many today. His attitude towards news stories can be summed up in three words. Verify,verify,verify. Publishing information that was wrong could earn you the label of “Yellow Journalism” a title no respectable editor or reporter wanted. Betty had an 11 lb baby? Poor girl.